WinTV Extend is an video streaming application built into the Extend versions of the WinTV v8 and WinTV v7.2. WinTV Extend takes the live TV signal from any Hauppauge TV tuner and converts the TV signal into a form (called 'HLS') which is compatible with an iPad, iPhone, iPod Touch, PC or Mac computer. WinTV Extend then 'streams' the converted TV signal over the Internet to the receiver device. WinTV v8 with Extend and WinTV v7.2 with Extend run on Windows based PCs with Windows 10, 8, 7, Windows Vista or Windows XP. It currently does not run on a Mac, though TV from WinTV Extend can be watched on a Mac. To run WinTV Extend, you need to have a WinTV TV tuner (or HD PVR 2 or Colossus 2) in your PC and your PC needs to be connected to either a home Wi-Fi network or the Internet. In addition, your PC needs to be fast enough to convert your TV signal to a digital form used for streaming (HLS). 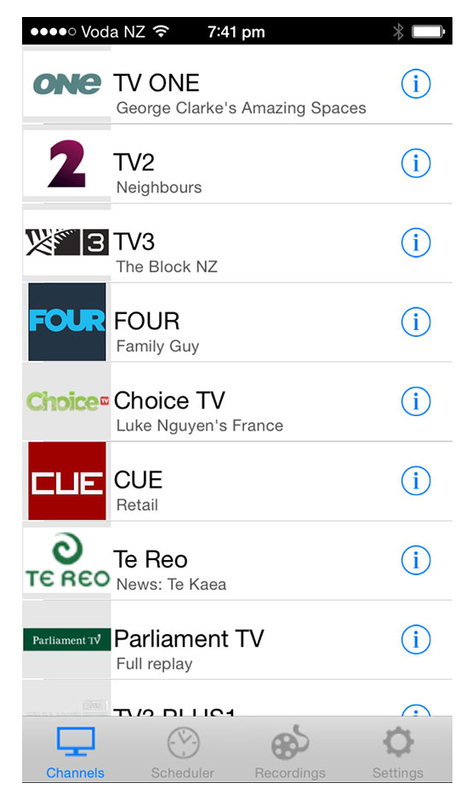 The WinTV Extend app is available from the Apple app store at no cost. To download WinTV Extend, look up 'WinTV Extend' on the Apple app store. 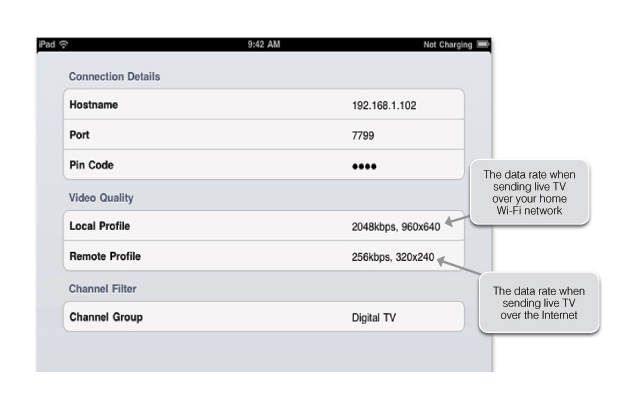 The WinTV Extend iPad/iPhone app uses a Wi-Fi connection only (no 3G or 4G support is currently available). 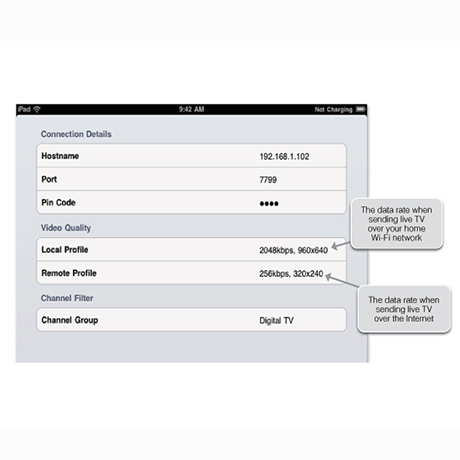 Wi-Fi can be used to watch live TV from your Hauppauge TV tuner in your home or in a hotel (as long as you have a Wi-Fi connection for your iPhone or iPad). If you want to watch TV over a 3G or 4G connection, you can use WinTV Extend with Safari or any other Internet browser. If you are using a Mac, PC or Android device, all you need is browser (Safari recommended on the Mac, Chrome or Internet Explorer on your PC). If you are using an Android phone or tablet, you need to be running Android version 4.1 or later. To run Extend on your device, you will use a browser. Please refer to the Extend Quick Install Guide in the section called "Watching TV on your iPhone, iPad or other remote device ". If you click on the Gallery tab above, you will find some screen shots of an iPhone receiving video from WinTV Extend. The iPhone pictures show the TV control overlay with Pause and 30 second replay. The WinTV-dualHD and WinTV-soloHD, all WinTV-HVR TV tuners for North America and Europe, plus the HD PVR 2, Colossus 2, WinTV-DCR-2650 and the Starburst satellite receiver, the WinTV-NOVA-T, WinTV-NOVA-S and WinTV-MiniStick products in Europe and Asia. 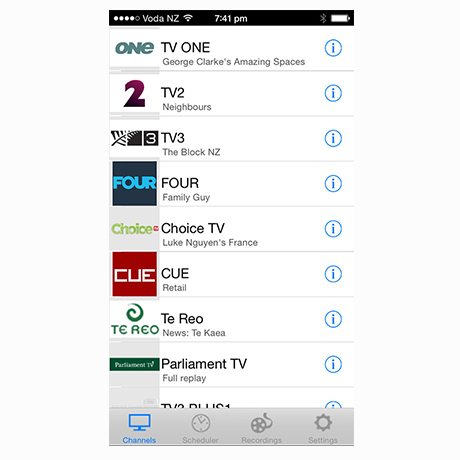 The new WinTV Extend app is available from the Apple app store at no cost. To download WinTV Extend, look up 'WinTV Extend' on the Apple app store. 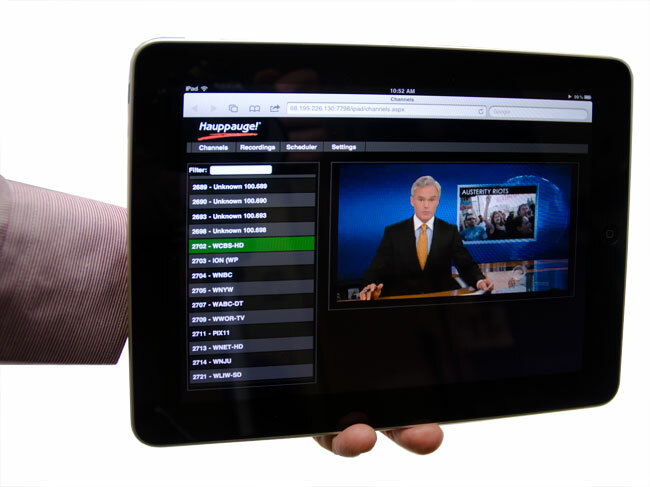 Watch live TV on your iPad, at home or anywhere in the world over Wi-Fi! WinTV Extend for the iPad is a TV application for the iPad which allows you to watch live TV from a Hauppauge TV tuner or to play back TV videos which were recorded with a Hauppauge TV tuner. 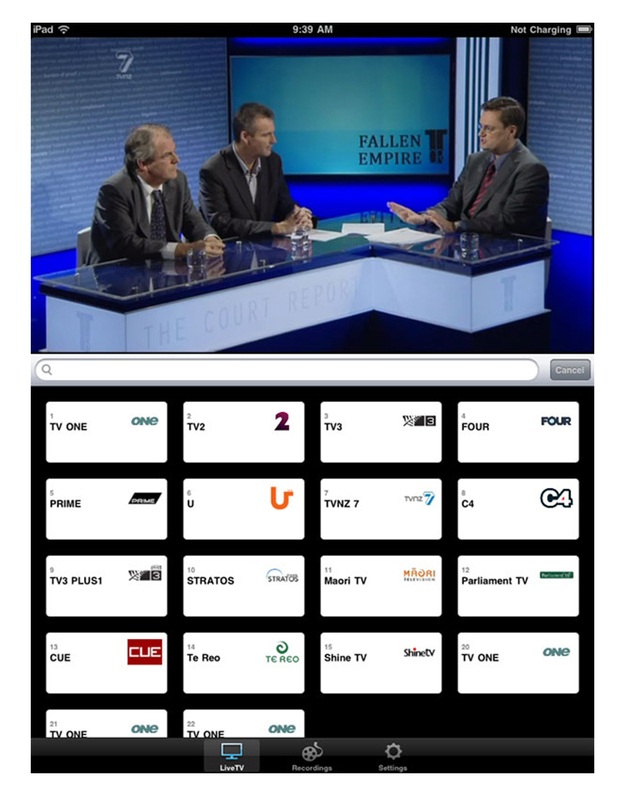 WinTV Extend for the iPad will allow you to watch all of the TV channels you can receive on your Hauppauge TV tuner. 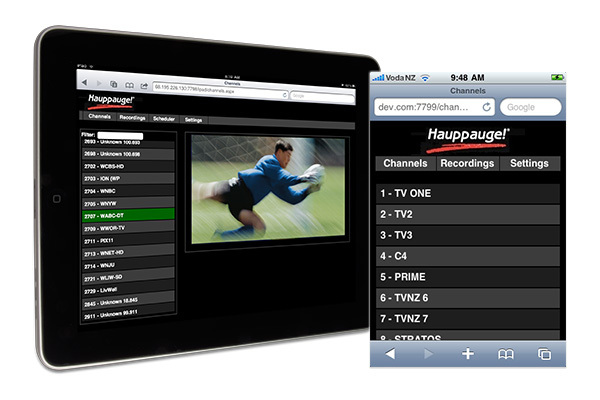 If you have recorded any TV programs with the Hauppauge TV tuner, you can also watch these TV programs on your iPad. server selection screen for remembering and choosing between multiple servers. WinTV Extend Server is an Internet video server built into the WinTV v7.2 application. To run the WinTV Extend Server, you need to have a WinTV TV tuner in your PC, and your PC needs to be connected to either a home WiFi network or the Internet. WinTV Extend runs on Windows based PCs (it currently does not run on a Mac, though TV from WinTV Extend can be watched on a Mac). 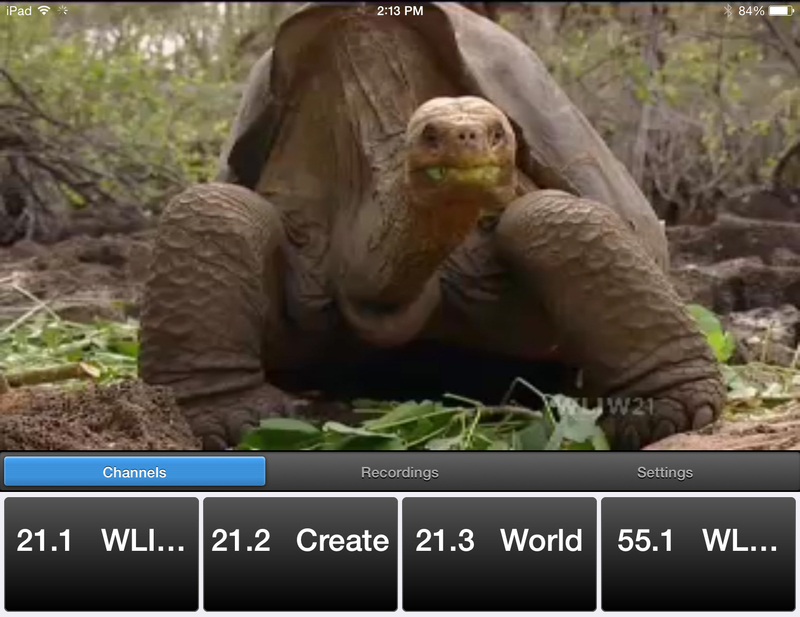 On your iPhone/iPad/iPod touch, all you need is the the WinTV Extend for iPad application. If you are using a Mac or a PC, you can also watch live TV from the WinTV Extend Server. All you need is a browser (Safari recommended on the Mac) and a Flash video player. If you click on the Gallery tab, you will find some screen shots of an iPad receiving video from WinTV Extend. All WinTV-HVR TV tuners for North America and Europe, plus the WinTV-NOVA-T, WinTV-NOVA-S and WinTV-MiniStick products in Europe and Asia. TM: iPhone, iPad and iPod touch are trademarks of Apple Inc., registered in the U.S. and other countries. Watch live TV on your iPhone, at home over Wi-Fi or anywhere in the world via the Internet! WinTV Extend for the iPhone is a TV application for the iPhone which allows you to watch live TV from a Hauppauge TV tuner or to play back TV videos which were recorded with a Hauppauge TV tuner. 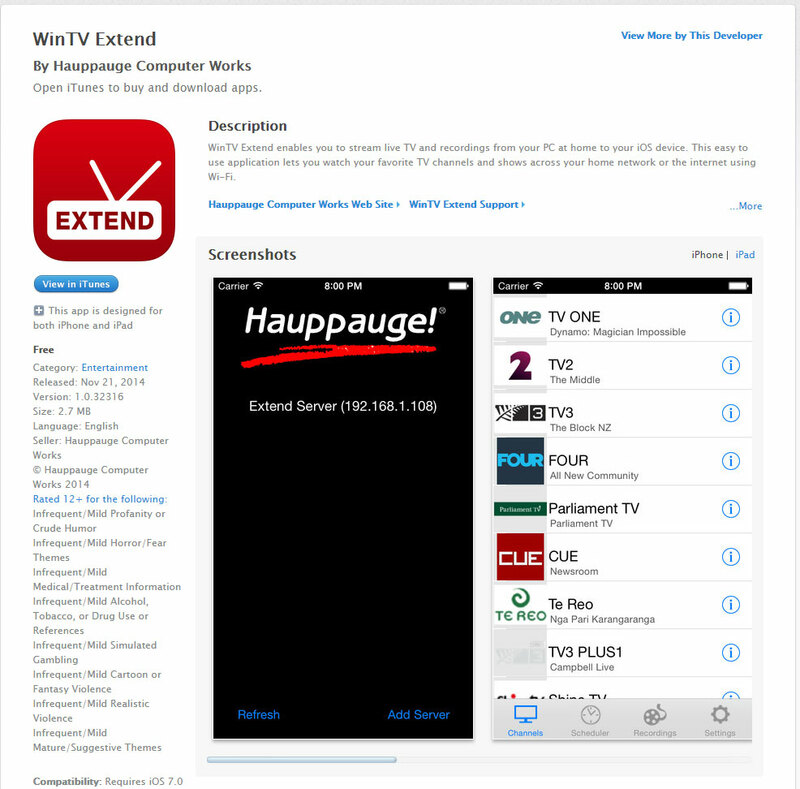 WinTV Extend for the iPhone will allow you to watch all of the TV channels you can receive on your Hauppauge TV tuner. 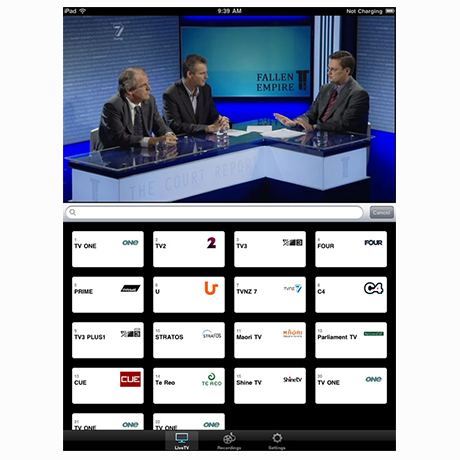 If you have recorded any TV programs with the Hauppauge TV tuner, you can also watch these TV programs on your iPhone. WinTV Extend Server is an Internet video server built into the WinTV v7.2 application. To run WinTV Extend Server, you need to have a WinTV TV tuner in your PC, and your PC needs to be connected to either a home WiFi network or the Internet. WinTV Extend runs on Windows based PCs (it currently does not run on a Mac, though TV from WinTV Extend can be watched on a Mac). If you click on the Gallery tab, you will find some screen shots of an iPhone receiving video from WinTV Extend. All WinTV-HVR TV tuners for North America and Europe, plus the WinTV-NOVA-T, WinTV-NOVA-S and WinTV-MiniStick products in Europe and Asia. Also for the HD PVR 2 and Colossus 2 series. How fast does my PC need to be in order to use WinTV Extend to stream over the Internet? We typically recommend an i5 or faster or equivalent. I have a data plan on my iPhone which is limited. How much data will WinTV Extend use? WinTV Extend, when used to send video over a cell phone network, consumes approximately 490 Mbytes per month for 10 hours of remote TV watching. When WinTV Extend is used through a WiFi network, there is no cell phone usage. Why can't I see all of my TV channels on my iPad? If you have problems seeing the complete TV channel list on an iPad, use two fingers to scroll the channel list. On the iPad, you need to touch a channel number once to set the channel. To scroll the channel list, use two fingers. Click once on the TV picture to see the video controls: 30 second replay, pause, play, full screen, audio volume adjust. My PC is running very slow when I'm using analog cable TV with WinTV Extend. What can I do to improve my system performance? If you are using analog cable TV, you will get better performance if you use a Hauppauge TV tuner with hardware encode. Hauppauge TV tuners with hardware encoders include the WinTV-HVR-1600, WinTV-HVR-1850, WinTV-HVR-1950 and WinTV-HVR-2250. Your system performance can improve by about 30% by using a hardware encoder. I'd like to watch TV on my iPad from outside my house. How do I open a port on my router so that this will work? For WinTV Extend to be used from outside of your home, you need to have an open "port" on your Internet router which allows video to pass from the PC which is running WinTV Extend to your iPad or other supported device. For instructions on opening a port on your router, click here. Can I use WinTV Extend with the IR blaster? Yes. If you have one of the Hauppauge TV tuners with a built-in IR blaster, WinTV Extend can use the IR blaster to change the channels on your cable TV or satellite set top box. Hauppauge TV tuners with a built-in IR blaster include the WinTV-HVR-1600, WinTV-HVR-1850, WinTV-HVR-1950 and WinTV-HVR-2250. Can I use WinTV Extend with the HD PVR? Yes. WinTV v8 includes support for the HD PVR. Get information on configuring your router at home so that WinTV Extend can send live TV over the Internet.